In terms of the key components used in connected living rooms, the market has been examined for sensors, thermostats, data storage systems, and communication devices. Of these, the segment of communication devices leads, accounting a marginally larger share as compared to the segment of sensors. Communication devices such as computer modems, and equipment for enabling Wi-Fi, Bluetooth, and infrared networks, and network interface cards are among the most commonly used components in connected living rooms. As a result, the segment accounts for a major chunk in the global market’s revenues. Consumer perception towards home automation has undergone a paradigm shift in the past few years. Home automation is no longer seen as a luxury, but has become a need and a means to gain better control over various aspects such as security, energy saving, and gaining enhanced convenience. The overall increase in disposable income and the availability of cost-effective components to set up a living room environment have led to a rise in the adoption of digital systems and devices. It is expected that consumer demands for such technologically advanced products will only increase in the coming years. As such, the global connected living room market is predicted to grow at a high CAGR in the coming years. The report helps in discovering the latest industry trends in the global connected living room market and uncovers scope for future growth. The hidden opportunities in the market and competitive threats are identified, and the qualitative analysis by TMR experts help in planning a corporate strategy to make progress in the industry. Some of the factors boosting the global market for connected living rooms include growing influx of advanced infotainment devices with competitive pricing and better resolution, surge in digitization of a large number of operations and processes which are a part of everyday routine, and constant advancements in technology. The increased affordability of devices and improved standards of living in developing nations are also driving the growth of the market. Moreover, government attempts to boost the proliferation of digital technology to improve governance and societal well-being are also encouraging consumers to adopt smart digital devices for everyday tasks. All these factors are expected to ensure a positive outlook and growth of the connected living rooms market over the forecast period. On the basis of geography, North America led in the connected living room market in 2015. The practice of investing significantly on transformation of living rooms from time to time is behind the growth of the market in this region. The region is also a step ahead in terms of adopting the latest technologies so as to fulfill customers’ wants for high-end and latest technologies in smart TVs, wireless devices, and home theaters. Thus, North America is anticipated to continue to grow in the connected living room market, at a healthy pace throughout the forecast period. 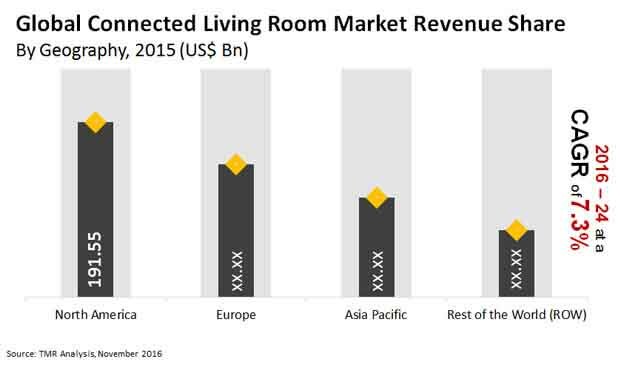 Europe is another region, witnessing significant growth in the connected living room market. The high standard of living and growing disposable income of the people are encouraging the growth of the connected living room market. As customers in the region are actively seeking technologically advanced electronic and digital gadgets, the market for connected living room will witness a steady growth. The leading manufacturers operating in the global connected living room market are Samsung Electronics Co. Ltd., Eaton Corporation, Seimens AG, Schneider Electric SE, Emerson Electric Co., General Electric, Rockwell Automation Inc., Toshiba Corp., Littelfuse Inc., and Hitachi, Ltd. The business and financial overview and information regarding mergers and acquisitions, collaborations, and partnerships are included. Information on business strategies adopted by companies and expansion moves is also discussed. As each company tries to come up with new innovation, competition in the market is expected to escalate.